These past two weeks have been busy ones! David Ball has been reporting on the arrests and sexual harassment of protesters by police at Vancouver "Casseroles" demonstrations in support of Quebec students. There is an audio report from an event when folks from CLASSE spoke in town with local people wondering what we can learn from Quebec. An anarchist report-back and photos were posted the same day as a 'Defiance not Compliance' protest against Compliance Energy's AGM. And there are some beautiful photos on the site, taken at a First Nations march on National Aboriginal Day, protesting the federal government’s cuts to youth programs. And there's coverage beyond the city limits too! Maryam Adrangi covered a forum about Burnaby residents' and Tsleil-Waututh Nation resistance to Kinder Morgan's expansion plans for its Trans Mountain oil pipeline. There are photos from a June 26 action, when antiracists confronted "Deportation Minister" Jason Kenney in Surrey. The VMC also funded a special project so that a reporter could travel to Saskatoon to cover an event and report on the testimonies and views of some of the thousands of residential school survivors participating. Articles about the struggle of Métis survivors for recognition and the critical discussion about reconciliation are posted. 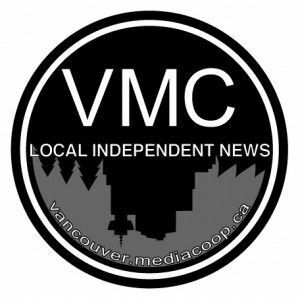 There's an interview with Gord Hill about anti-capitalist resistance and violence, an update after the June 13th shooting of Yoli Oqueli, an activist organizing against Vancouver-based Radius Gold in Guatemala. And there has been much more going on in and outta town! Want to suggest a story, post, edit, organize or just lighten your wallet a bit to help others keep doing all of those things? We have a couple meetings coming up this month and we'd love to see you there! First up is tomorrow: Wednesday, July 4, 6:30pm at Spartacus Books (684 East Hastings, between Heatley and Princess). We'll gather again - same time, same place - on Wednesday, July 18. The Vancouver Media Co-op is reader funded, collectively run, open publishing and always looking for more people interested in critical, participatory and democratic media in Vancouver and beyond. Drop us a line at vmc (at) mediacoop.ca, check out the ‘About’ info on our site, follow us on twitter or facebook, or come and say hi in person! There's also an ongoing open discussion about updating the design of the Media Co-op. Weigh in! See you on Wednesday, online, or in the streets!